Spanish police said Monday they had arrested 182 people who took part in a ‘national’ cockfighting competition, an ancient sport that continues in some regions despite being banned. Officers seized around 300,000 euros during Saturday’s raid in the southern town of Sangonera La Verde, police said in a statement. In 2011, police arrested around 100 people at a cockfight held in the same spot. Cockfighting sets two roosters – trained to be aggressive and often pumped with steroids – against each other in a ring, often fighting to the death. Sharp knives are often added to the birds’ natural spurs while spectators gamble on the outcome. Police seized 97 live roosters and six dead ones as well as 87 marijuana plants. The 182 people who were detained were charged with animal abuse. Under Spanish law, a person found guilty of animal abuse can face up to a year in jail and up to a year and a half if the animal is killed. 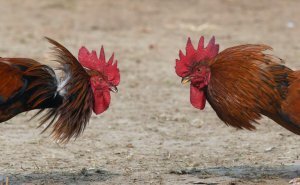 Cockfighting, which dates to before the Roman era, was popular throughout the Middle Ages, but a distaste for the sport developed in the 19th century and animal rights activists began protesting against the practice. It was outlawed in Britain around 150 years ago.